Ideal candidate has extensive knowledge of major designers, top national, regional and online fashion outlets, is extremely well versed in utilizing mainstream social media platforms, and can preferably start as soon as possible. Swavy app is looking to hire a savvy, passionate, self-motivated individual as a fashion assistant. The company is a web and mobile-based application built to enable swift and easy purchasing through one-click technology. Duties would include daily monitoring of popular sites, identifying each individual component of the photographed outfits, and compiling the aforementioned information in an efficient and organized manner. Individual would also aid in strengthening relationships with stylists and talent, as well as day to day office tasks. Ideal candidate has extensive knowledge of major designers, top national, regional and online fashion outlets, is extremely well versed in utilizing mainstream social media platforms, and can preferably start as soon as possible. This is a full time position with great opportunity for growth; salary is commensurate with experience. To apply, please send your resume to Alexandra at aporath@swavy.com. You will assist with all production related duties involving lucyparis branded and private label clothing. Elle Communications Seeks A PR Assistant in LA & Interns In LA + San Diego!! Elle Communications is a growing PR firm with two offices in San Diego and Los Angeles. We are creative in approach and extremely personalized in execution. The corporate culture is an exceptionally positive environment built on constant growth and learning, support, respect, hard work and recognition. Our client base is a unique amalgamation of innovative organizations and individuals who are making the world a better, more interesting place. For more information, visit www.ellecomm.com. The ideal PR Assistant candidate has a strong work ethic, is incredibly results-driven, highly organized, has experience in a PR agency, can provide an impressive portfolio that showcases understanding of traditional and digital PR tactics and platforms, is able to demonstrate knowledge of a wide range of media outlets and social media platforms and comes armed with great references. Black Frame Is Hiring A Fashion PR Assistant In NYC! 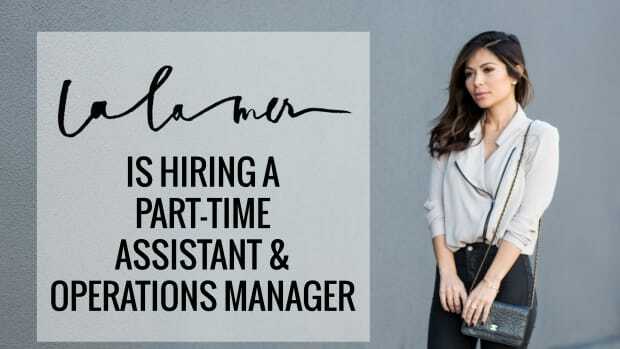 In addition to office work, La La Mer is looking for someone who is also a creative and can help with photos and images for blog and social media usage.